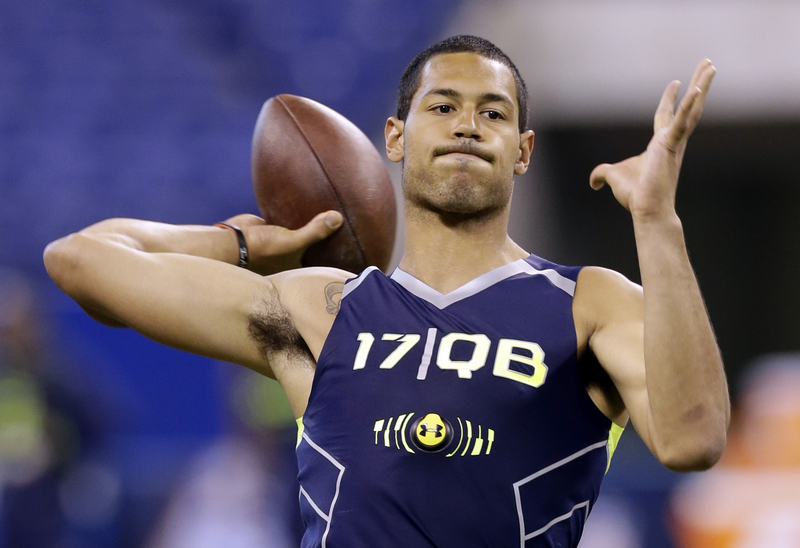 Logan Thomas looked great the 2014 NFL Combine, but he will have to overcome some of the film from this playing days. The 2014 NFL Combine is now in the books. We will give recaps of the players that made money by improving their draft stock. Today we start on day two of the Combine when the skill players were on display. The first group to compete were the quarterbacks. This year’s crop of quarterbacks is good, but some say there is not an Andrew Luck in the group. Every year the big debate is whether or not the top QB’s will throw. This year was no exception with Teddy Bridgewater, Johnny Manziel and Derek Carr choosing not to throw. That opened the door for some of the lesser known quarterbacks to improve their draft stock. Blake Bortles – Central Florida – (6-5 223 lbs. ): Great size and has a big arm. Surprising athleticism for someone his size. Throws a nice deep seam ball. Likes to attack defenses with the deep ball. Very good anticipation. Had a good day. Improved his draft stock by throwing and could possibly be the first QB taken. Sometimes struggles with ball location. At times he trusts his arm too much and makes mistakes throwing into coverage. Had a 32.5″ vertical jump (#4 QB) and a 9’7” broad jump (#3 QB). Tajh Boyd – Clemson – (6-0 222 lbs. ): Did on field drills, but did not stand out. Has a big arm and moves around well in the pocket. First ACC QB to throw for over 30 touchdowns in 3 straight years. Very hard worker that understands the game and likes to attack defenses. Very underrated, but is a winner. Derek Carr – Fresno State – (6-2 214 lbs. ): May be the best quarterback after the “big three” (Bridgewater, Bortles and Manziel), but did not throw in the drills. As someone who is trying to be drafted in the 1st round, he probably should have thrown. He may have left the door open for other quarterbacks to move in front of him by not throwing. Did well in the measurables. Ran a 4.69 40 yard dash (#5 QB) and a 4.20 short shuttle (tied for #3 QB). He also vertical jumped 34.5” (#2 QB). Jimmy Garoppolo – Eastern Illinois – (6-2 226 lbs. ): Continues to improve his draft stock after good showings in the East-West Shrine Game and the Senior Bowl. Strong arm and quick release. Good athleticism. Ran a 7.04 3 cone drill (#3 QB). Jordan Lynch – Northern Illinois – (6-0 217 lbs. ): An athletic player that is a better runner than passer. Looked better as a passer than he did at the Senior Bowl. May be a late round pick that could be asked to change positions. Ran a 6.55 3 cone drill (#1 QB) and 4.20 short shuttle (tied for #3 QB). Johnny Manziel – Texas A&M – (5-11 207 lbs. ): Measured in shorter than he was believed to be and did not run as fast as most people thought he would. Decided not to throw in the drills, but did the measaurables. Ran a 4.68 40 yard dash (#4 QB), 6.75 3 cone drill (#2 QB) and 4.03 short shuttle (#1 QB). Had a 31.5” vertical jump (#5 QB) and 9’5” broad jump (#4 QB). A.J. McCarron – Alabama – (6-3 220 lbs. ): Great understanding of the game. Has worked hard to get past the stigma of being a game manager. Underrated arm and has a smooth delivery. Throws a good deep ball with nice touch. Nice anticipation. Good footwork. May have improved his draft stock by throwing during the drills. Stephen Morris – Miami – (6-1 213 lbs. ): Athletic. Strong arm. Great physical tools, but still waiting to see him put it all together. Ran a 4.63 40 (#2 QB). Connor Shaw – South Carolina – (6-0 206 lbs. ): Extremely tough. Plays through injuries. Great understanding of the game. Good football player, but will he be able to play QB at the next level? Ran a 4.66 40 yard dash (#3 QB) and 7.07 3 cone drill (#5 QB). Had a 34.0” vertical jump (#3 QB) and 9’8” broad jump (#2 QB). Logan Thomas – Virginia Tech – (6-6 248 lbs. ): Great size and athleticism. Amazing physical skills. Has the arm to throw 50 yard passes with ease. May have looked the best of any QB that threw at the Combine. Very inconsistent on film. At times looks unstoppable, but has more bad film than good. Needs to work on his footwork. Ran a 4.61 40 yard dash (#1 QB), 7.05 3 cone drill (#4 QB) and 4.18 short shuttle (#2 QB). Had a 35.5″ vertical jump (#1 QB) and 9’10” broad jump (#1 QB). It will be interesting to where he will be drafted. Some team will eventually take a flier on him because of his physical skills. This entry was posted on March 6, 2014 by draftmaniacs in All-Star Games and Combine and tagged 2014 nfl combine, 2014 NFL draft, Blake Bortles, Johnny Manziel, Logan Thomas, NFL, NFL Draft, Teddy Bridgewater.